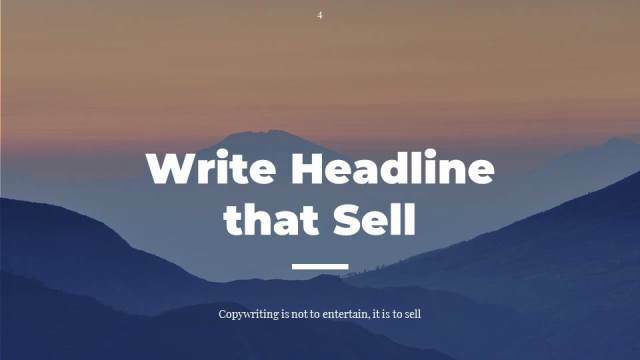 It is challenging time to write a headline that sell. Message in digital internet medium explode. So many messages are in our gadget. Usually, we ignore most of the information include ads. Ads create a message to sell products. We read the headline first. If the headline is interesting, we read more the ads. Therefore, a headline is the first important bridge to all advertising. Fail in the headline is fail in all advertising. Whatever amazing offer we say in the body, the reader does not give attention if the headline fails. Headline exists in almost every ads or copywriting. In magazine ads, it is the title of advertising. In the email, it is subject of the email. If you write copywriting on Facebook, it is in a status post. What are criteria of good headline? How to creates the headline? Good headline make reader read next text. Copywriting job is to sell, but headline has task to make audience stop and read body copy. If selling in the headline is not get their attention, don’t do it. Good headline only want to get attention from target market. Get attention to all people is not necessary. It select audience by mention target group or by specific offer. The headline offer a reward for reading the advertising. It give benefit for time reader spent. It is better, if benefit in headline related to the offer. If it is not related to products, it can distract and get false target market. Originality is not necessary. But good headline has to persuasive, convincing, memorable. So it is not problem if we use cliché headline if it is work to sell. Good headline get reader’s attention. How to creates the headline? If headline offer helpful information or promises that matter for reader’s self-interest. Famous Advertiser, John Caples said that 3 way to get good headline. First, it is appeal self-interest. Second, it is like news style. Third, it is curiosity headline. Audience has interest. Then he give attention to headline that connects to the interest. For instance, audience interest is money, relationship, power, prestige, et cetera. Famous headline in America is “How to Win Friends and Influence People”. That is headline of Dale Carnegie book. It offer benefit to self-interest, relationship and power. Another headline is, “How to Get Money from Home”. It is also give promise something that satisfy self-interest. Self-interest headline usually use words, such as free, take, get, money, health, enjoy, avoid, save, result and so on. News headline offer new situation that reader need to update. People need news about their society, development of economy, technology, social and culture. For instance, news headline often use words now, here, announcing, breakthrough, discover, new invention, at last, new way, and so on. Curiosity headline use hilarity, mystery, intrigue. The headline usually using word, secret, must, why, how, what, when, where and so on.